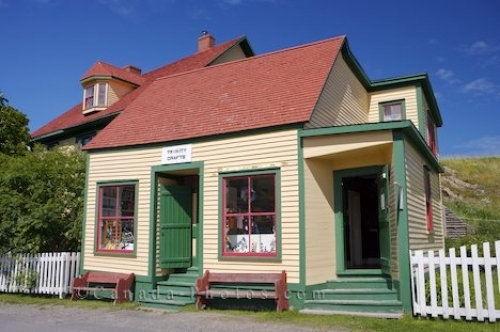 The exterior and gift shop at the heritage Hiscock House in the town of Trinity in the Bonavista Peninsula in Newfoundland, Canada. The town of Trinity in Newfoundland, Canada has many heritage buildings and a stroll through the streets lets one see how time seems to have stopped. The Hiscock House, built in 1881, was home to a husband and wife who had six children. The husband, Richard was lost at sea and Emma Hiscock was bound and determined not to wallow in her sorrows and make a life for herself and her children. Tours are available to see first hand how life was in 1910 for families and costumed people are found inside the Hiscock House where they perform duties from that time period. A gift shop at the Hiscock House is open to the public where heritage items and souvenirs are displayed. The Hiscock House in the town of Trinity, Bonavista Peninsula, Trinity Bay, Highway 239, Discovery Trail, Newfoundland, Newfoundland Labrador, Canada. Picture of the Hiscock House, a heritage home owned by the same family until the 1980's in the town of Trinity, Newfoundland.